BROTHERS annual reunion will be held at Brothers Community Club, Grange on Saturday, Sep 7 at 5.30 p.m. and all past and present players, officials and supporters are most welcome – after they have cast their votes in the Federal Election. Those in attendance will receive an up-date on the progress of the Brothers NRL Bid Team’s work, but most importantly it will be a chance to relive the club’s glory days. The 1968 Premiership winning side will receive a special mention on the 45th anniversary of their 21-4 win over Easts in the BRL decider. 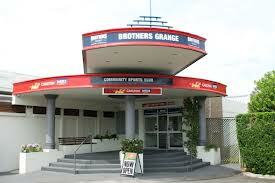 Brothers continue to have a strong presence at their traditional home at the Grange, with the Second Division side (coached by Scott Munro) holding raffles every Friday from 5.30 p.m. They play their home games at Gibson Park, Stafford. The Brothers Bid Team Working Committee meets at the club on a regular basis. Plans are afoot for an improved display of Brothers memorabilia at the licensed club which boasts former skipper, Trevor Bailey as a director.